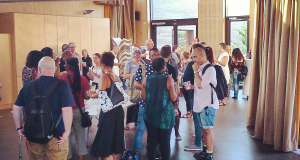 On Tuesday 22nd July 2014 we brought together freelancers, teachers, music hub staff, organisations and performers who all have a passion for music education for an evening of networking in the stunning Queen Elizabeth Olympic Park. Director of Sound Connections Philip Flood opened proceedings with a short speech highlighting the importance of these events for people working in the music education sector. Networking opportunities and creating links between practitioners and organisations reduces the feeling of isolation that music practitioners often encounter at some stage in their career, and builds a supportive environment of skills and practice sharing across the sector. Phil Castang, CEO of Newham Music Trust, also spoke briefly on his experience of living and working in Newham, and the work of the Trust in the local area. We were joined by the fantastic Solid Harmony Collective, who engaged our guests in an impromptu vocal workshop and performed some of their fantastic repertoire. Thank you to all who came for making the evening such a success! We will be announcing our upcoming Would Like To Meet… November 2014 soon – watch this space!